Finally, despite some pretty rotten weather earlier in the year, our vines are looking lush and green. Of course the goats adore them, but I see no reason why they should get all the fun, particularly as they get so many at harvest time. It’s quite possible to harvest a reasonable number of leaves from each vine without doing any damage, so it seems obvious to look around for ways to use this extra bounty. Vine leaves make a wonderful wrapper for goat’s cheese, one which looks fabulous tied with a bit of rustic looking string or straw. But the best use for those fresh young leaves is to make dolmades with them. 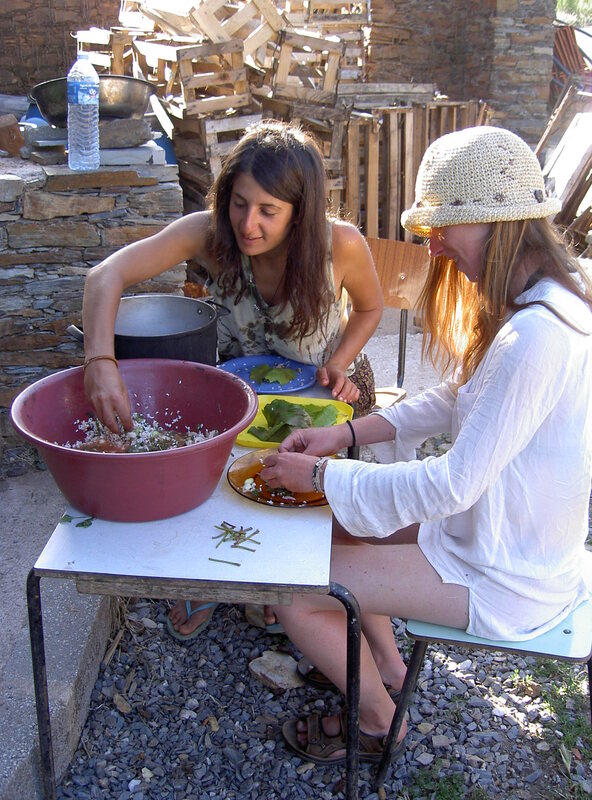 This recipe has been put together for us by Nicola, one of the participants in our most recent Permaculture Design Course and a current volunteer. 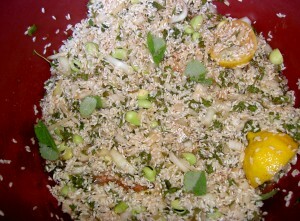 Nicola is Greek Cypriot, so the recipe is guaranteed authentic! 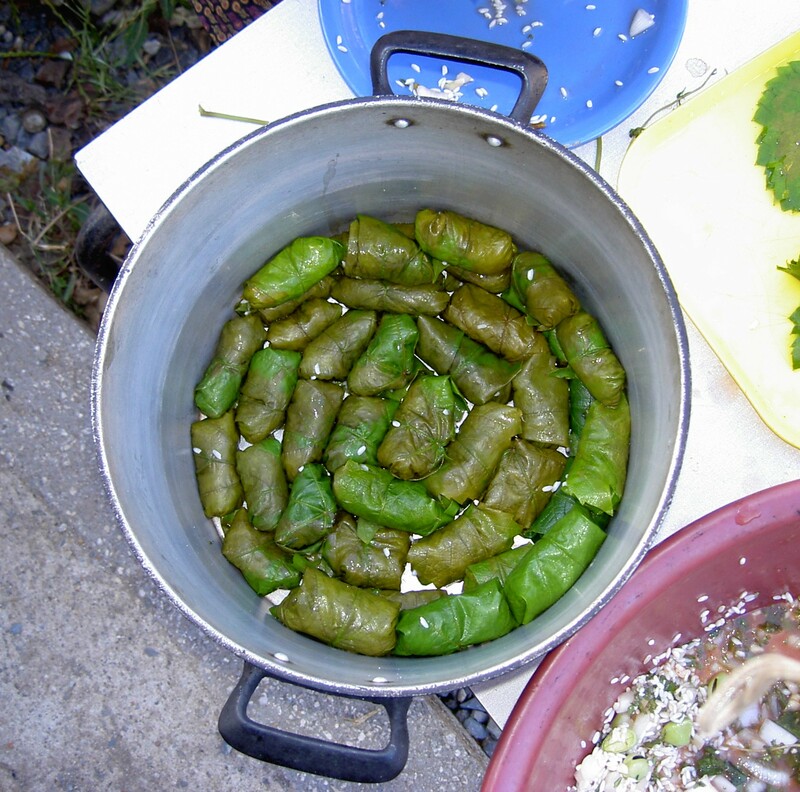 Collect a pile of vine leaves, one per dolmade. You’ll want ones which are still tender, so not too huge. Cover them with water containing a spoonful of salt and a dash of vinegar and leave them to soak whilst you prepare the filling. Any other herbs or veggies that you like. Red pepper, mushrooms, broad beans, feta cheese …..
Our version was vegetarian, but if you like to include meat you can add minced lamb to your filling mixture. When it’s time to form the parcels lay your leaf on a plate with the stalk facing you and veined side up. Clip the stalk off and put about a tablespoon of mixture in the centre. Pull the two outside leaves across the mixture and upwards, then the top leaf downwards over the top, rolling the parcel over and smoothing the leaf flat. Your parcel should be vaguely rectangular. There’s a technique to this, but you’ll get faster with practice. Nicola, of course, was an expert and made me feel as if I had 13 fingers! She told us about how this part of the process can be a family or neighbourly event. 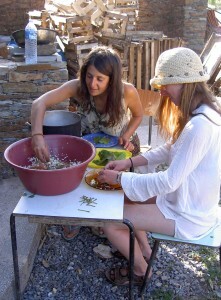 Noone minds the preparation when it’s combined with good company working towards a delicious shared meal. 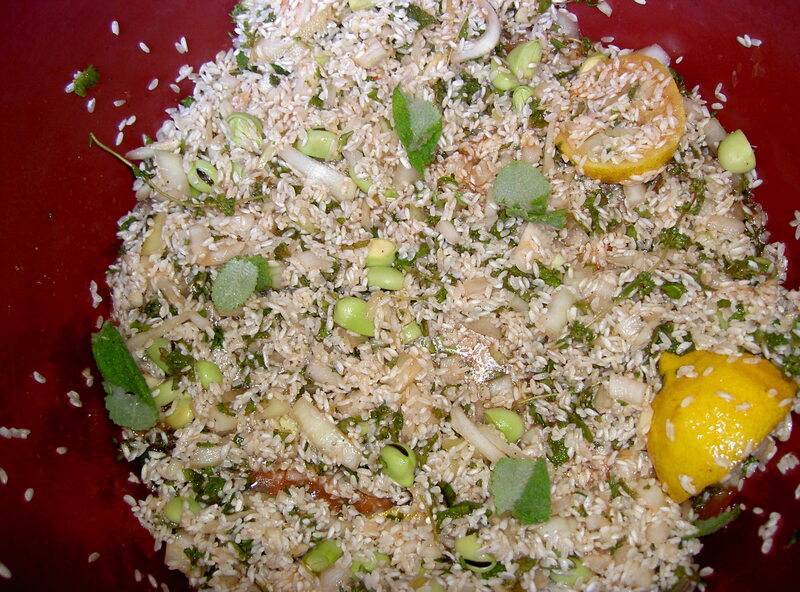 Pack the parcels tightly into a pan in a spiral working from the outside in. The side with the flap should be facing downwards. They need to be packed tightly so that they don’t unfold during the cooking process! Now just cover the little parcels in water and place a heavy plate on top to stop them rising up, then simmer for 30-40 minutes or whenever the rice is cooked through. 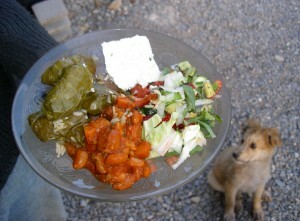 I’m hungry now… goes off in search of vine leaves. We made them and they were great. Excellent! I’m glad you managed to find some vine leaves in the end, and hope you had some left over to brine for later.